(0 Customer Reviews) | Write Review 12 issues per year The UK's best-selling magazine for new and experienced renovators. 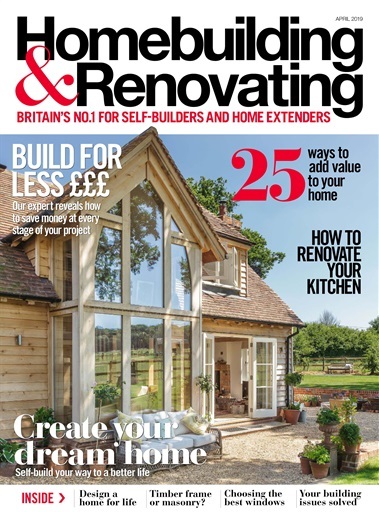 Each issue of Homebuilding & Renovating is packed full of inspiration and offers expert advice on a range of topics, from finding land, house design and choosing an architect, to planning permission, selecting materials and budget control – everything you need to ensure your project is a success. Inside we show you how to self-build your way to a better life. The UK's best-selling magazine for new and experienced renovators. Each issue of Homebuilding & Renovating is packed full of inspiration and offers expert advice on a range of topics, from finding land, house design and choosing an architect, to planning permission, selecting materials and budget control – everything you need to ensure your project is a success. You'll receive 12 issues during a 1 year Homebuilding & Renovating Magazine magazine subscription. You'll receive 12 issues during a 1 year Homebuilding & Renovating Magazine magazine print subscription.